My colleague, Richard Conlin, president of the City Council, has written a well-argued opinion piece over at Publicola.net about the Alaskan Way Viaduct replacement project. I agree with Richard wholeheartedly. Please read it. Those who oppose the deep-bore tunnel replacement project, including Mayor McGinn and other environmentally-focused leaders who favor alternative forms of transportation and reduced reliance on highways and vehicles, might have ground to stand on if Seattle had three or four major north-south thoroughfares. But we only have two—Interstate 5 and State Route 99—because of our unique geography. Giving up one of these two thoroughfares in an effort to "force" people out of cars is economically far too risky, in my opinion. As Port Commissioner Bill Bryant said a couple of weeks ago, the people who will pay for miscalculation here are the approximately 70,000 local families and workers who rely on a strong, successful maritime and industrial economy. Remember, the central waterfront project—including removing the viaduct—is closely linked to the Spokane Street and Mercer corridor projects that are already underway. All of of these projects—Spokane Street, Mercer and Alaskan Way—must be successfully completed in order to protect our core economic strength which is our maritime, industrial and manufacturing base. This set of projects is also about opening up our central waterfront to everyone, creating public open space, reconnecting downtown to the Puget Sound, and improving our quality of life. As Council President Conlin points out in his piece, Seattle can follow the experience and leadership of other American cities who have revitalized and energized their waterfronts by making smart decisions. We are on that course today and the City Council is strongly united to see this vision to reality. Some, including Mayor McGinn, suggest that the Council does not understand the risks with this work or that we are not protecting the interests of Seattle taxpayers. Nothing could be further from the truth. While the Mayor is objecting and issuing press releases, the Council is actually engaged in serious negotiations with the state to protect our interests, including those of every Seattle taxpayer, and monitoring these projects to make certain we fully understand what is happening, why it's happening, and how best to protect our interests. We are meeting every week with the state and our legal, engineering and technical experts to make sure we are satisfied with the moving-forward progress that is being achieved. And through all of this, we have made very clear that the City of Seattle and our taxpaying property owners are not responsible for any cost overruns related to the state-controlled segments of these projects. In the next couple of weeks, we will consider legislation that makes this point abundantly clear. So, which course would you follow? Continue to build on the ten or more years of successful regional planning that has gone into these projects and create an amazing central waterfront while, at the same time, protecting our core economic and transportation foundation? Or, stop the project dead in its tracks because you disagree with the decisions already made and take us in a new direction that potentially threatens our core economic base? This is an easy choice for me. If you want to catch a glimpse of what traffic flows might be like along Alaskan Way and through the new deep-bore tunnel watch these two videos. One is a driver's perspective traveling northbound, and the other offers a southbound perspective. The Alaskan Way surface street and the replacement deep-bore tunnel are part of a major project that will transform how traffic moves through the center city, including Spokane Street and the Mercer Corridor Project. These projects must be viewed in their totality, not as individual elements. They are integrated and well justified. Let's keep our eyes on the end result we desire: improved transportation flows, including for freight mobility, improved bicycle and pedestrian access, and reconnecting the central waterfront with the rest of downtown. Earlier today I did a walking tour of the Battery Street Tunnel which was closed for inspection and cleaning. I "ran" through the tunnel back in the late 1970s as part of the Seafair Torchlight Run (when I could run! ), but today was the first time I had a personal tour. It's bigger when you're standing on the pavement and not just whisking through in a car. The Battery Street Tunnel, built in the mid-1950s, will likely be closed when the new deep-bore tunnel replacing the Alaskan Way Viaduct is opened in 2015 or 2016. Inside the northbound lanes we watched as a sewer-rat video camera broadcast images from deep inside the storm drainage system running under the tunnel. The video camera is mounted on a husky little platform with four large rubber tires; it reminded me of one of the police department's bomb detection mobile cameras. The camera "vehicle" is lowered into the sewer by a technician who then "drives" it through the sewer, remotely controlling its speed and camera angle. At the north portal of the northbound lanes, crews were drilling deep soil bores, some as deep as 170 feet, to collect soil samples for testing and evaluation. The north portal of the new deep-bore tunnel will be in this general area and soil sampling is an important part of the engineering work required for tunnel design. In the above photo, I'm watching as a technician transfers some of the soil sample to a small jar for additional testing. The whole operation seemed like a crime scene forensic exercise; collect the evidence, package it for transmission to the lab, wait for the results. In the southbound tunnel we watched as the walls were cleaned with a giant, truck-mounted brush, then sprayed with a cleansing solution. Last night, the fire suppression system was tested. The sprinklers in the tunnel are designed to release a deluge of water if there is a fire. We also tested the emergency phones positioned at several points in the tunnel; I picked up one handset and the police 911 center answered in seconds. As we stood at the north end of the tunnel, I tried to visualize what it will be like in a few years to drive into a new tunnel that will stretch all the way south of the stadiums and how I would use the three streets that will be opened across Aurora just to the north (John, Thomas, and Harrison), a transformation that will reconnect lower Queen Anne with the south Lake Union area. Once completed, the Mercer Corridor and the Alaskan Way Viaduct replacement projects will revolutionize how we move between these neighborhoods. After 40+ years of congestion, confusion, delay, and debate, we are finally on the verge of good solutions. It's about time! 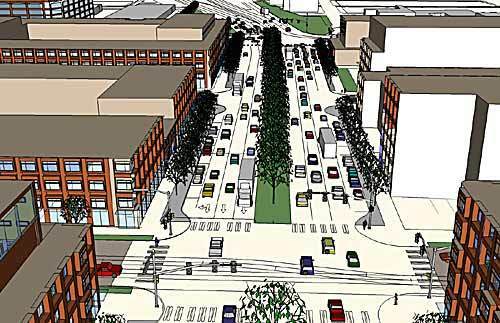 The Council released a letter this week regarding the Mercer Corridor project. Every member except Councilmember Licata signed. Download city_council_mercer_letter_oct_2008.pdf. This project will be discussed at a public forum Monday evening at 6 p.m. here at City Hall. Read my earlier post regarding Mercer Street here. (Note: Updated March 16, 2009.) There has been some controversy since the Council voted 8-1 to continue work on the two-way Mercer Street project. Some see the project as a boondoggle designed only to benefit Paul Allen and his interests in the South Lake Union neighborhood. Others view it as a waste of money because the promise of traffic congestion relief is minimal at best. Still others argue that competing projects, such as north end neighborhood sidewalks originally promised in the 1950s should have higher priority for the limited public funds available. I voted with the super majority on this issue and here's why. First, the two-way Mercer Street project is about a lot more than just traffic congestion relief, although that certainly is a worthy justification. This project is one of several to improve our city's livability and it must be viewed within an overall strategic framework. The big picture goal is to reunite two important neighborhoods, South Lake Union and the Uptown neighborhood (lower Queen Anne, to many) while also creating a link or union between the lake, Seattle Center, and the central waterfront. Two-way Mercer is also one of several steps aimed at reconnecting the east and west sides of Aurora Avenue North and returning neighborhood cohesion to this important area of our city. The other steps are re-opening three streeets across Aurora at Thomas, Harrison, John Streets and extending Sixth Avenue North all the way to Mercer Street. These moves would significantly improve the street grid throughout Uptown and South Lake Union and, along with two-way Mercer, improve traffic flow and access. Another part of this overall strategic framework made possible by the changes described in the paragraph above is the addition of bike lanes on both Valley and Roy Streets, and the incorporation of the formerly-named "Potlach Trail" into the new street grid connecting South Lake Union to the central waterfront through the Uptown neighborhood. These street changes also need to be considered as part of the city's overall Urban Mobility Plan which is currently being developed in our effort to replace the Alaskan Way Viaduct with a deep-bore tunnel and surface street along Alaskan Way that will allow us to remove the viaduct and revitalize the central waterfront. Last, but certainly not least, two-way Mercer, along with the other steps I've described, allows the streets immediately adjacent to Lake Union Park to be transformed into a pedestrian, bicycle, and vehicle friendly area serving as a gateway to the park. So, I voted in favor of continuing planning, financial feasibility studies, property acquisition negotiations, and other necessary work because the two-way Mercer project is just one element of a broader strategic plan to improve two neighborhoods (Uptown and South Lake Union) that will accept more density and jobs in the coming years. The project makes good urban planning sense,good environmental sense, and wise financial sense when viewed in the context of the larger strategic goals for the area. Second, I reject short-term, status quo thinking which is often a mask for a not in my back yard or anti-growth mentality. We are well past the growth-no growth debate. Our region, and our city, has adopted a growth management plan that calls for Seattle to accept more residents and to cluster these new residents in our Urban Centers. The Uptown and South Lake Union neighborhoods are both Urban Centers. The Mayor and the City Council have taken a firm stand on this issue and it won't be reconsidered. Seattle is going to see an increase in population over the next 20 years. The issue is how to accommodate this growth wisely and efficiently. I keenly remember several projects in our city's history that were opposed because they (a) would contribute to growth, (b) cost too much, or (c) seemed to favor developers and property owners. Remember the late 1960s when we twice rejected a light rail system because it would cause growth and damage Seattle's small-town atmosphere? You can ride our light rail system in Atlanta, Georgia today. City officials who fought hard for passage of the Forward Thrust transportation measure deserve kudos. Too bad we failed to follow their bold leadership! Remember, too, the opposition to Pacific Place downtown? It was cast as a give-away to a private developer, a waste of city resources. Pacific Place is the single most important anchor development that contributed to the revitalization of our downtown business core. It's a great example of a public-private partnership that resulted in huge public benefits to our city, primarily strong economic transformation of our downtown. I appreciate the leadership Mayor Norm Rice and others demonstrated to win approval of that project.